Losing a parent can be a life-changing experience; our relationship with our mother and father can be complicated depending on where we are in our own lives and our dependence of independence from them or on them. Whether a parent dies unexpectedly or after a long decline, someone who influenced your life more than most is suddenly no longer there. As expected as this loss is in our lifetime, it is a milestone that creates a void that can’t be filled by any other person. Regardless of the nature or quality of the relationship we may have had with our parents, their death can still have a profound effect on us. The loss of a mother or father is one of the most common types of loss, with 5% of the United States losing a mother or father in any given year. Because of this “commonality,” even though the grief following the death of a parent may be acknowledged initially, some may wrongly assume that we should be able to overcome this particular loss more easily. As mentioned in the main Understanding Grief section, your grief will be individual and unique. How and for how long you process grief will be different than for anyone else, and you need to allow yourself to grieve and cope with the death of your parent in your own way. You’ve known your parent (or parents) longer than anyone else in your life. Even if you had a challenging relationship or lived separately from them for part of your life, your parent still influenced you — for good or for bad. If you come from a traditional family, your parent cared for you as you grew up. Your mother or father shared your joys, sorrows, failures and accomplishments over the years. Even when you are an independent adult, your parent still thought of you as their child, which is part of your identity. The loss of a parent when you are an adult can create confusing emotions. Even though you are independent, you may feel abandoned regardless of your age. 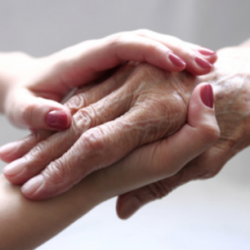 If you were a primary caregiver for an aging or infirm parent, this confusion can be heightened since you have lost two roles: you were someone’s child, but had also been acting as their parent. You may also be required now to take on a new role or assume more responsibilities in your family. This combination of loss, a shift in roles and the resulting mix of emotions can be difficult to process, but allowing yourself to be aware of and reflect on your emotions is critical. Trying to tamp them down or to tell yourself to just “move on” won’t help you move toward healing. A parent’s death can exaggerate other emotional issues in your life. It often brings up feelings about your own mortality or can cause you to question the value of other relationships in your life. At the very least, it may underscore the reality of how short life is and how quickly time can pass. You may feel a need to make changes in your life, to reach set-aside goals or identify new ones. Give yourself time to heal, and then reassess those ideas — the death of parent, as painful as it may be, can also provide you with the impetus to live your own life more fully. Other changes that may occur include becoming closer to your siblings or a surviving parent. You may emerge from the experience with more maturity and self-reliance. If you are the eldest child, you may take on a new role as the assumed leader of your family. One after-effect of the loss of a parent is the potential for positive change in the aftermath of grief. Long-term challenges to manage during bereavement are “grief triggers.” Many things can trigger a return to intense grief — expected things like a birthday, a holiday or the anniversary of your parent’s death. Or more subtle experiences like seeing clothing once worn by him or her, catching a scent of perfume, or smelling a particular food being cooked. A common trigger can also be the death of another relative or friend, or a pet…even “secondhand” grief. Someone you might not know well dies, yet this may trigger your grief again. All of this is normal, expected, and something you should allow yourself to feel; do not judge yourself for reacting or not reacting to any of these triggers. Developmental issues can also trigger grief, especially for children or adolescents — when a girl has to start high school without her mom or when a boy turns sixteen and realizes he doesn’t have his dad to teach him how to drive. Or when a wedding is being planned and there is no father to walk down the aisle with or mother to dance with. Know that grief triggers exist and may affect you, and that they’re inevitable and normal. If you’re sharing a holiday or lifecycle event with other relatives, talk to them ahead of time about their expectations and agree on strategies to honor the person you all loved — and how to compassionately support each other. Other topics that may be helpful to you during your time of grief include the Mourner’s Bill of Rights, as well as the recommended readings to the right and the related links to the left.